A great variety of single-axle, sometimes called two-wheel, walking, or pedestrian tractors is available. The smaller models generally have a single-driven shaft which can be fitted either with rotary cultivator blades or with wheels for pulling trailers and trailed implements. Larger models often have a pair of driving wheels and an independently controlled drive for rotary cultivating. Engines usually run on gasoline in the smaller sizes and use diesel fuel in larger sizes. Transmission systems range from V-belt drive (with speed changing by means of stepped pulleys, and belt tensioning providing a clutch) to multispeed gear transmission with friction plate clutches. 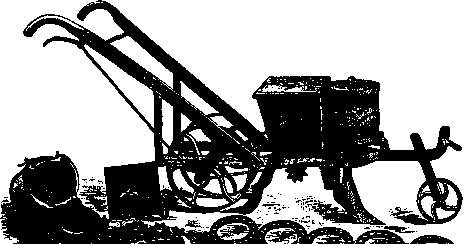 Most manufacturers can supply a range of attachments for cultivation and transport work, and water pumps can usually be fitted, although it should be remembered that pumping is generally an arduous duty for a small engine, One maker supplies a threshing attachment with a rasp, bar-type drum, and concave. Single-axle tractors have sometimes proved to be very successful in intensive agriculture on relatively soft soils which need thorough rotary cultivation—for example, in irrigated rice paddies in Asia or on market-gardening plots in Europe. They have been much less successful for relatively extensive agriculture on hard soils such as those in some savannah regions of Africa, where large areas have to be covered and tined cultivation is often more appropriate than rotary cultivation. Like all small-engine-powered equipment, single-axle tractors require a good network of spare-part supplies, a high level of operator training, and regular maintenance, particularly in hot and/or dusty working conditions.